Leafcutter bees are great craftswomen! With a name like leaf cutter, you would think these bees are scary for plants, but they only use what they need. A leaf cutter bee will carefully carve a half-moon shape out of broad leaves or petals to fashion egg cells for her young, and the size of that cut corresponds to the size of the leaf cutter species. 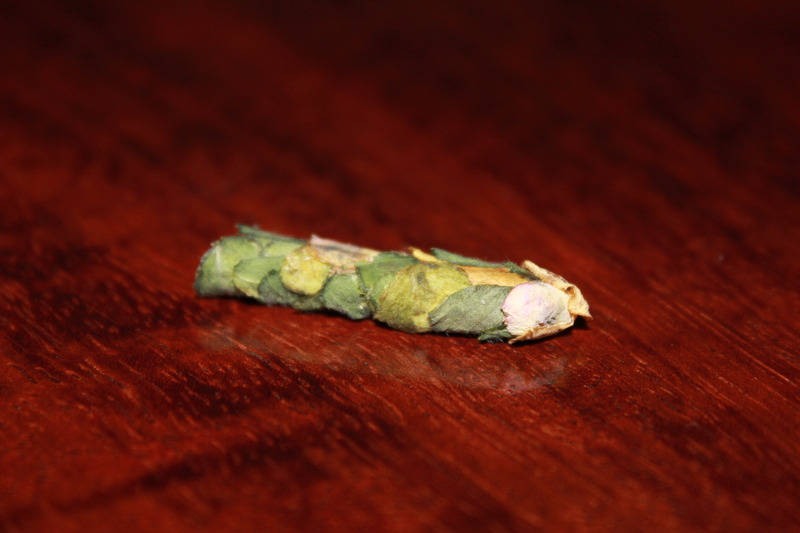 One leaf cutter variety is around 1″ long, while the other is roughly 1/4″ long. So, if you see different sizes on your leaves, you have different varieties of leaf cutters in your yard. If you see half-moon cuts like this one in your broad leaf plants, you have leaf cutter bees living in your yard. Leaf cutter bees will use flower petals too! Leaf-cutter bees are another native species of bees found in most parts of North America. They are smaller than a honeybee, and have darker stripes paired with pastel yellow colored stripes across the abdomen. The scientific name for this species is Megachilidae, and their name says it all, they do cut leaves for a purpose. They get their name from the way they use pieces of leaves to form egg cells which they then store in long, hollow cavities. They use a glue-like substance from glands near their mouths to sew pieces of leaves together, which they have carved from leaves of lilacs and other broad-leafed plants. The shape is that of a half-moon, and the size of the piece they take is very consistent. They only take as much as they need, never destroying the plants from which they take the leaf fragments. This is what the inside of a leaf cutter bee nesting hole looks like, as seen in our observation house (soon to be available again). A row of beautifully crafted nesting cells from my leafcutter bee house. Leafcutter bees are a solitary breed, like the mason bee. This translates into a more docile creature with nothing to defend but her life. So the only time she would sting would be to defend her life, and this is a rare occurrence, making her a very welcoming guest in your own yard! I have spent many minutes peering into the nesting blocks while these busy bees fly in and out going about their nesting business. I never once felt threatened by them, and in fact, felt ignored, entirely! This is also true of the nature of mason bees. There is one row capped with leaves! And there is a leafcutter bee going into another row to nest. Unlike mason bees, leaf-cutter bees will do their own excavating of soft rotting wood, or holes in thick stemmed plants, and in any conveniently located crevice. They also like having conveniently located nesting blocks with inviting holes as well, and we have had success with them nesting in ours. Nesting blocks need protection, so they must be paired with a nice house, and we have many options. Like mason bees, leafcutter bees are very good pollinators compared to the honey bee, because of where they carry pollen. One leaf-cutter bee can pollinate at least what 20, and even up to 40, honey bees can pollinate. Leaf-cutter bees do not have pollen carrying baskets on their hind legs, but they do carry lots of pollen via static cling created by the hairs on their abdomen called scopa. The way they visit flowers is much like the mason bees, diving into the pollen as they fly from flower to flower. This technique sets them apart from honeybees and makes them very effective pollinators. Look at all that pollen on this leaf cutter bee’s abdomen! Finally, leaf-cutter bees do not make honey, but they cultivate quite the production of food sources, as well as flower seed production, through their fierce pollinating efforts, and it would be foolish not to recognize this talent useful to us as humans. Like the honeybee, leafcutter bees, along with all other species of bees, need our help! Become a great host to these fascinating creatures, along with other species of pollinators, by setting up a complete habitat for them this season. Ever wonder what bees do over winter?